The NN-E271WMBPQ looks smart, and performs well, as well as being simple to setup and operate. None to speak of - we didn't find much to criticise about this microwave, given the low price tag. The Panasonic NN-E271WMBPQ is a compact microwave oven - small enough not to take up too much of your workspace in your kitchen, but still large enough to accommodate the majority of dinner plates. As such it is probably aimed at smaller families and households - if you have a relatively small kitchen then this model is worth considering. It is a white solo microwave - meaning it does not feature a grill or convection oven facility, and features an overall capacity of 20 litres, together with 800w of power. This small capacity means it will probably be unsuited for very large dishes - however it is ideal if you require a simple method of heating and cooking foods - being a solo microwave there is very little to go wrong with it, and the fact that NN-E271WMBPQ is manufactured by Panasonic gives a degree of reassurance. Our experiences with Panasonic microwaves is positive - even with the lower end models such as the NN-E271WMBPQ, they are well built and function as intended without any issues. This is one of the advantages of buying a well known brand of solo microwave, over a smaller and newer company who may not be able to offer the same level of customer service. The interior of the NN-E271WMBPQ has an easy wipe grey coloured acrylic surface - which is helps to make cleaning this appliance simple and practical. Our testers found it very simple to clean, with a quick wipe down after use sufficing. Despite the cheap price tag, the overall build quality and construction is very good - it feels pretty solid compared to many of it's equally priced competitors. Granted the Panasonic NN-E271WMBPQ doesn't feature the same attention to detail as Panasonic's higher end microwaves, such as expensive stainless steel construction, but for the money we really can't complain. The initial setup of the clock took a couple of minutes to sort - but this is a one off operation, assuming you regularly don't unplug the appliance. The display is clear and easy to read - we even tested it in bright sunlight in one testers kitchen, and it was still perfectly legible. Overall the NN-E271WMBPQ has a pretty smart appearance - our testers agreed that it was aesthetically pleasing - it's modern looks suggest that it will suit the majority of kitchens. In use it performed it's intended functions beautifully, without issue. Essentially the NN-E271WMBPQ is a compact solo microwave, which based upon our testing period should prove to be reliable. The controls are very well labelled, and it's simple to clean after use. It will provide an ideal method of heating and cooking food for those on a budget. 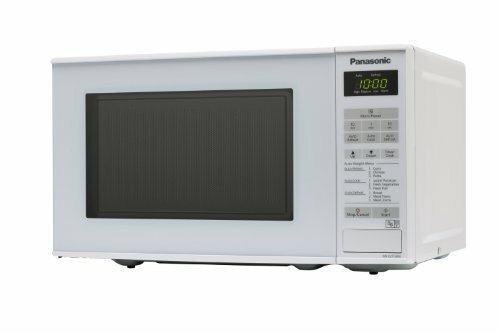 If you're looking for a cheap solo microwave, then Panasonic's NN-E271WMBPQ is well worth a closer look. If you're looking for a smart compact microwave, without spending a fortune, then we'd recommend looking at the Panasonic NN-E271WMBPQ - a bargain at just over £60. A superb cheap microwave for your home or workplace, which should stand the test of time and provide years of service. my Panasonic NNE271WMBPQ is making a loud whirring noise when being used. Is it going wrong, if so what is the problem please. Apart from the NN-E271WMBPQ microwave from Panasonic, you can check Panasonic Genius NN-S973S oven as well, it has a great specification and pretty well priced too!